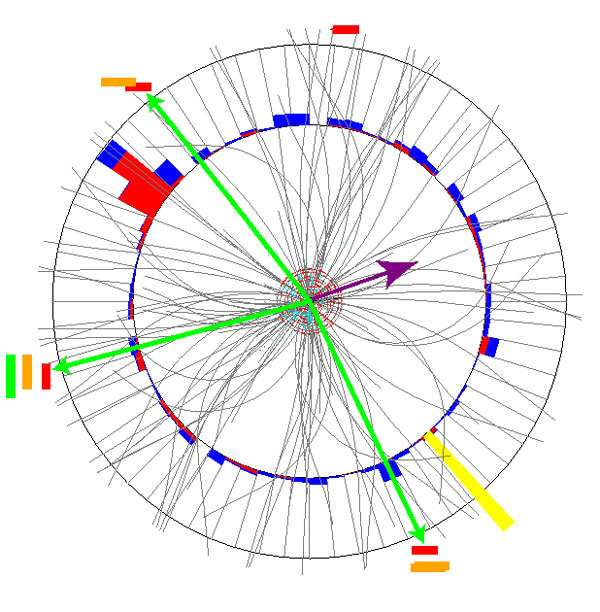 Record of a collision at Fermilab’s Tevatron. DZero team, Fermilab. I’m a fan of physics and cosmology, partly because theoretical physicists speak a language that often sounds as fanciful as that of mystics. Dark matter, dark energy, the holy grail of a unified theory–astrophysicists can sound for all the world like John of the Cross probing the dark “night more lovely than the dawn” and particle physicists’ tracings appear as mysterious as the illuminations of Hildegard of Bingen. because then we have to go back to the theoretical drawing boards. It would be exciting to be sent off in a new direction but really boring just to find [what we’re looking for]. The biggest misconception about science is that scientists are happy understanding things. In fact, if you’re a theorist, you’re happiest when you don‘t understand things. Nature surprises us, and that’s the great thing. If nature wasn’t more imaginative than we were, we could just sit in closed rooms and come up with theories of everything, but in fact nature surprises us. That’s what makes science exciting–that the search is [about] not understanding. This is a really important point. What science is really about is going into the unknown and not finding what you expected, and that’s really what get’s the juices flowing. Krauss says that for many people being perplexed is uncomfortable. For scientists, to be perplexed is the best state of mind. The more we discover about ourselves, the more we discover about the universe…..